It takes an hour to get here from Washington, D.C.
You head north on Interstate 270, pass by the main exits for Frederick and continue onto U.S. Route 15. Catoctin Mountain comes into view. And as Cactus Flats Roadhouse passes by on your left, be on the lookout for your exit: Mountaindale Road. You wind down through fields, passing by Mountaindale Convenience Store. When you have to choose right or left, choose left, and continue on what is still Mountaindale (Putnam Road is to the right). If you start seeing log cabin-inspired homes and the Cold Deer Hunting and Fishing Club, you chose correctly, and are almost there. You park in a small nondescript lot across from the entrance to Fishing Creek Reservoir, putting you just a little jog away from the bottom of a dirt road angled upward. A sign, before you enter this dirt road, notes your location: Frederick City Watershed. Before I tell you more about my favorite dirt-road loop ever, let me say that I am hardly an expert of everything these 7,000 acres of beautiful forest land – known officially as the Frederick City Cooperative Wildlife Management Area – offer. I know it is popular among hunters and fisherman. I know that it is owned by the City of Frederick but managed by the Maryland Department of Natural Resources, and located between Gambrill and Cunningham Falls state parks. 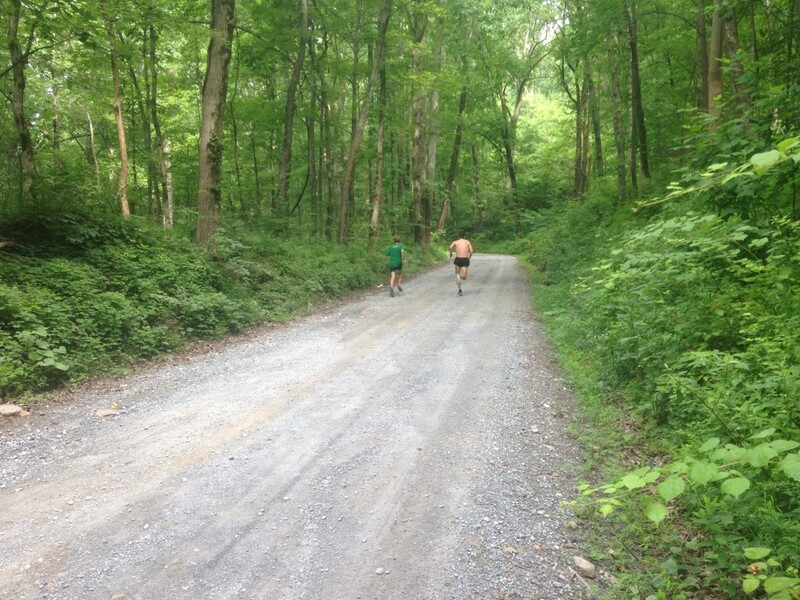 I know, from what I hear, that there are some incredible trails in these woods: enough, in fact, to host the Catoctin 50k. And I know Camp David is somewhere in this woods-sphere. But I am not exactly the trail shoes and mud-and-rocks type, or even a fan of casual trail running, really. This was the first time, when I brought my GPS watch for this run, that I noted how much elevation I gained. I am a road runner. Another way of saying it is: the dirt roads that most visitors use to get where they’re going here, that is where I’m going here. The climb, from the beginning, is never steep, exactly. It is steady, with 1,000 feet of elevation gained in the first four miles. Those first 15 minutes, while your legs are still stiff, can be a little rough. But then you start to loosen up, and you find your groove in the dirt road, and you listen to the streams, and look at all the trees, and you find yourself amazed, with the shade and the dampness, that it feels cooler than the actual temperature. You think, This is the hard training. At this point in a run, Charlie, Luke, and I, typically, would be, as that line in John Parker’s “Once a Runner Goes,” gabbing like magpies. But right now the conversations are more staccato. Luke, for one, realizes his heart rate is not far below his target for a tempo. The Olympic Trials qualifier – and just a righteous individual – had planned to add on a little 20-minute pick-up at the end after we finished the loop, but happily discovered the climb was sufficient. When you first start out, you are technically still on Mountaindale Road. But soon you reach a fork, where left is Fishing Creek Road and right is Gambrill Park Road. I advise going left, and not taking any turns until you have to, about four-plus miles into the run, where you turn right on what is … Gambrill Park Road. Confused? Think of it this way: now you are returning on the road you chose not to take at the beginning, or heading back towards that fork. After you turn right, this is where the road flattens out, and starts gradually giving you back 1,000 feet. Starting out, two-plus minutes over your typical training pace, as Luke noted, gets your heart rate up. Towards the end, running much faster than usual is breezy. I wish I could remember how I found this place. My first newspaper job was in Frederick, and I think maybe another runner told me about it. This was back in 2005 or 2006, and I wasn’t using things like Google Maps or GPS watches. The first time I ran here, that left early on at the fork was a guess. And as I took in my surroundings, and got to thinking how much better this was than being around cars and stoplights and smashing my legs on pavement, I started hoping really hard that I was beginning a loop and not an out-and-back, and that I would get back to my car before dark. Thankfully, it worked. I was done in 65 minutes and wrote “9” in the log. Now I know the loop, thanks to the watch, is closer to 10. When I lived near here, I did this loop once or twice a week. Sometimes I would park up at Cactus Flats, run down on Mountaindale Road, do the loop, get in about 17, then head into Cactus Flats for some bluegrass and an adult soda. I also sometimes would do the loop once, stop at my car for a gel and water, and do it again. In 2006, I ran my best in the marathon, so maybe the hard training on these roads really works. Maybe this watershed holds secret speed work. All I really know is that running here is a lot of fun and refreshes your spirit. You feel really free on these roads: that clear sense of place – like, I am in Maryland, I am in D.C., I am in Virginia – slips away. Also, afterward, you feel really hungry. So bring some snacks, or stop at Mountaindale General Store, and load up for the hour-ride back, like we did, with snacks on the cheap: Gatorade, chocolate milk, processed cakes, Pop Tarts, salt-and-vinegar potato chips, cookies, and moon pies. This article originally appeared in the September/October 2014 issue of RunWashington.